Stanford researchers traced back methane leaks from contaminated drinking water in Pennsylvania and Texas to shale gas wells. However, they note that they did not find a link between the contamination and the technique used to drill for shale gas itself, called hydraulic fracturing or more commonly known as fracking. Instead, the researchers concluded that well integrity is the main driver for the contamination. 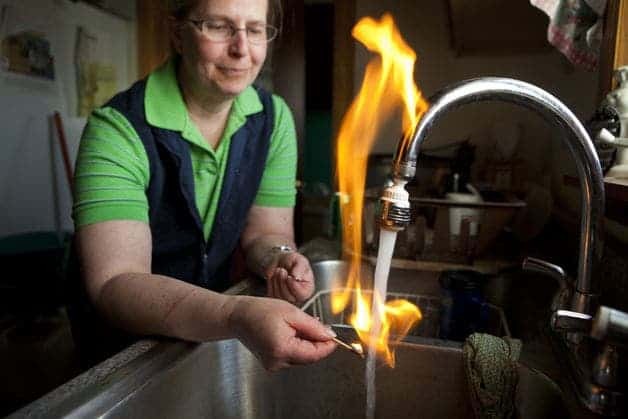 For the past couple of years there have been numerous reports of households whose water supplies had been contaminated with unusually high concentrations of methane. You might have already seen some famous footage on the internet (less on TV) of various people who would open the tap, light a flame and set the water on fire. It’s not joke – these stories are actually for real! Since these incidents never happened before the shale gas boom, naturally everyone was extremely suspicious that the contamination came from fracking wells. Oddly enough, the Environmental Protection Agency was very slow at conducting tests and investigations. In some cases, the agency – a highly important government agency tasked with protecting the United States’ people, fauna and nature – was actually ‘bullied’ by oil and gas companies. That shouldn’t have stopped the EPA from conducting tests of its own, however, instead of relying on reports produced by oil and gas companies, which were obviously biased. Indeed, tests ran independently by Duke University researchers found 54.7 milligrams per liter of methane in a random sample of drinking water in December 2012. Curiously, the Range Resources study conducted just a month earlier found a mere 20 milligrams and 4.2 milligrams in mid-2012. Water in the vicinity of operations in the gas-rich Barnett Shale contained 83 milligrams per liter, according to a University of Texas-Arlington. The federal limit is ten milligrams per liter. The Stanford team analyzed the gas content of 130 water wells in Texas and Pennsylvania, and used noble gases to trace the path of methane as these inert chemicals are not affected by microbial activity or oxidation. By measuring the ratios of noble gases to methane gas they could accurately determine the likely source of the methane leak. Of the 133 water wells (113 wells in the Marcellus shale in Pennsylvania and 20 in the Barnett shale in Texas), the researchers identified eight clusters with problems. “The mechanism of contamination looks to be well integrity,” said one of the authors, Prof Robert Jackson from Stanford University. Although in one case the methane leak was linked to a failed underground drilling well, the researchers couldn’t identify a causal link between the actual technique employed – fracking – the methane contamination. “These results appear to rule out the possibility that methane has migrated up into drinking water aquifers because of horizontal drilling or hydraulic fracturing, as some people feared,” said Prof Avner Vengosh, from Duke University. The researchers suggest that while there are strict regulations that should prevent these sort of faulty wells, these are ill enforced since often times contractors are under pressure to finish their work fast so they can move on to the next well – remember, we’re in a full shale boom! Also, since gas prices have steadily went down, companies are making lower margins and have become negligent. “You need strong rules and regulations on well integrity,” said Prof Jackson. A lot of voices are saying, especially following these findings, that fracking is safe – if strict design and maintenance regulations are followed. Unfortunately, water contamination isn’t the only problem linked to fracking. There’s arsenic poisoning, copious amounts of methane leaked into the atmosphere, fracking chemicals of unknown toxicity, fracking-caused earthquakes and long term risks to the biosphere.